Nice dude... I know exactly what you mean about the mean... how the light isn't spread evenly. btw... awesome license plate... lol b4 I got my custom plate... I had "5RUG216"... Oo off topic but my friend's neighbor has "5RUG555" on his explorer... and I caught some criminals one time making a getaway in a Camry with plate "5RUG288"
Last edited by flightz71; Mon, Sep-22-2008 at 09:19:53 AM. Find More Posts by Got_S54? just ordered these parts for my carbon fiber CSL trunk!! 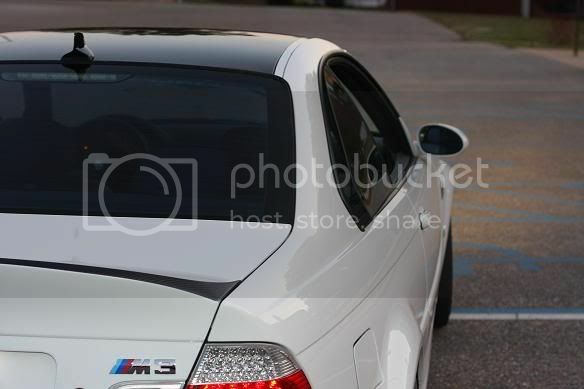 cant wait to have both of them on the ///M. just put on the vcsl boot and the light install is the last step....is there a good website to order the parts from or did you all just call a dealership?? thanks! MODS: AA High Flow Exhaust | AA Gen 4 Headers | AA Software | PSS10 | TMS Front & Rear Camber | CSL Brakes | K&N Drop In | VCSL Roof | VCSL Boot | VCSL Hood (Not Installed) | CF Side Grill | Lots More! You can get them from pelicanparts or tischer, but the price at my dealer was about the same with tax versus the shipping/handling that you'd need to pay to buy them online, and the dealers will usually have the lights there in 2 days (they tend to always have the connectors in stock). All times are GMT. The time now is 02:06:17 PM.